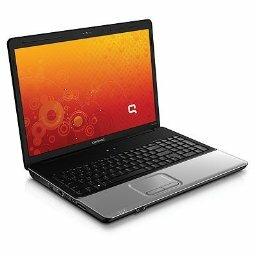 HP offers the Compaq Presario CQ70-120US notebook PC, which is part of Compaq’s CQ70 family. Compaq’s Presario CQ70-120US is powered by an Intel Pentium Dual Core T3200 2GHz mobile processor, 3GB of DDR2 RAM, 250GB hard drive and integrated Intel GMA 4500MHD graphic chipset.Windows Vista Home Premium comes pre-installed on the 250GB hard drive, and a DVD burner is included. The CQ70-120US also sports an 802.11a/b/g/n Wi-Fi module, an Ethernet connection and a 56K modem. For teleconferencing and video chats, a built-in webcam is present. Three USB ports and an ExpressCard slot allow for expansion, while a 5-in-1 media card readers lets users quickly transfer photos and multimedia files to and from the notebook. A VGA port lets users connect other monitors. Thus configured, the CQ70-120US weighs 7.2lbs and is meant to act as a desktop PC replacement thanks to its full-size keyboard and numeric pad. It is available for $579.99. 1 Response to "Compaq new Presario CQ70-120US notebook"
hi i have a problem with my laptop hp compaq presarion c795EK that my wireless do not working and i haven’t the driver of controleur ethernet. all of my education is stopped because im styding informatiqe with my my laptop and i always work with wireless. please help me. think u very much for help.